Constituted as 354 Fighter Squadron, and activated, on 12 Nov 1942. Redesignated as 354 Fighter Squadron, Single Engine, on 21 Aug 1944. Inactivated on 20 Nov 1946. Redesignated as 354 Fighter-Interceptor Squadron on 11 Sep 1952. Activated on 1 Nov 1952. Inactivated on 8 Jan 1958. Redesignated as 354 Tactical Fighter Squadron, and activated, on 13 Apr 1962. Organized on 25 Apr 1962. 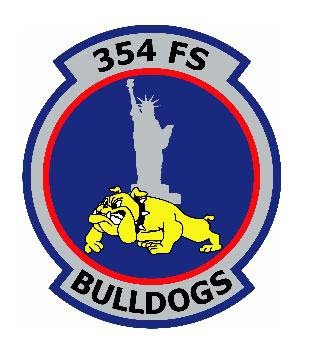 Redesignated as 354 Tactical Fighter Training Squadron on 1 Apr 1979. Inactivated on 30 Apr 1982. Redesignated as 354 Fighter Squadron, and activated, on 1 Nov 1991. The Bulldogs 2nd place during the 2010 Hawgsmoke competition in Boise Idaho. The 354th flew combat missions in the European Theater of Operations from, 14 September 1943–25 until April 1945 and in Southeast Asia from, 13 March–12 until June 1965. It conducted combat crew training from 1971–1982 and forward air control training since 1991, and is now the only combat ready operational squadron at Davis-Monthan AFB, AZ.